The marketing industry's top information, best advice, research, and insights in one place. Your learning resource to stay up to date on the buzz. Optimizing your website to generate leads is a no-brainer. But it’s not as simple as throwing a “click here” button on your home page and watching the leads pour in (unfortunately). Instead, marketers and designers need to take a more strategic approach. In this post, we’ll go over some quick ways that actually work to optimize your website for lead generation. Download the beginner’s guide to converting website visitors into leads for your business here. Now that we’ve gone over the basics of lead generation, we can get down to the dirty details. Here are 10 simple ways to optimize your site for lead generation. 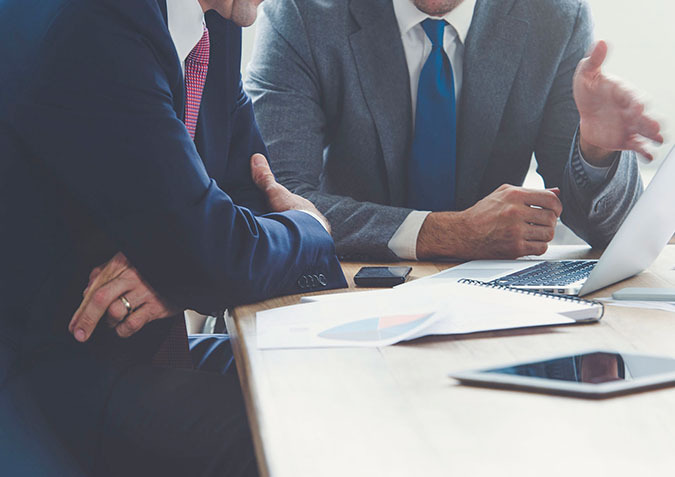 It’s important to benchmark your current state of lead generation before you begin so you can track your success and determine the areas where you most need improvement. Some of your pages might make excellent lead generators and you don’t even realize it. Email Marketing: Traffic might come from users who click through to your website from one of your emails. Social Media: Traffic might come from users who engage in a campaign through one of your social media profiles. Live Chat: Traffic might come in the form of users who reach out to your customer service team through a live chat window on your website. Blog Posts: Traffic might come from your highest-performing blog posts. Once you identify where your leads are coming from, you’ll want to make sure the pages they’re landing on are doing everything they can to nurture a visitor’s interest. For example, if, through your analytics tool, you realize most of your potential leads are clicking on inbound links to your website from your Facebook page, your next step is to update the pages they’re visiting with content that keeps them on and engaging with your website. On your most visited website pages, add longer-form content that visitors can access through forms that solicit their contact information. 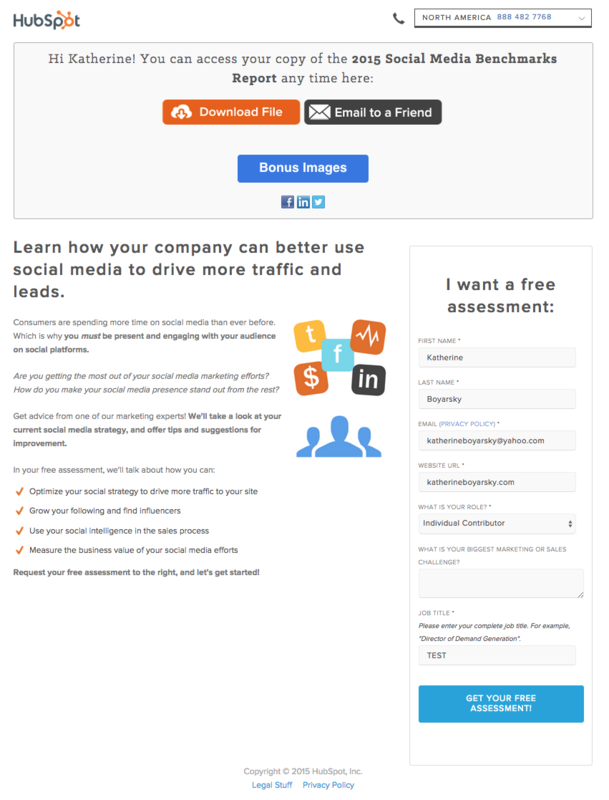 Test how each of your existing lead generators is contributing to your business using a tool like Website Grader, which evaluates your lead generation sources (including landing pages and CTAs) and then provides feedback on ways to improve your existing content. You can also compare landing pages that are doing well with landing pages that aren’t doing as well. For example, let’s say that you get 1,000 visits to Landing Page A, and 10 of those people filled out the form and converted into leads. For Landing Page A, you would have a 1% conversion rate. Let’s say you have another landing page, Landing Page B, that gets 50 visitors to convert into leads for every 1,000 visits. That would be a 5% conversion rate — which is great! Your next steps could be to see how Landing Page A differs from Landing Page B, and optimize Landing Page A accordingly. Finally, you could try running internal reports. Evaluate landing page visits, CTA clicks, and thank-you page shares to determine which offers are performing the best, and then create more like them. If your visitor searched “lawn care tips” and ended up on a blog post you published called, “10 Ways To Improve Your Lawn Care Regimen,” you’d better not link that blog post to an offer for a snow-clearing consultation. Make sure your offers are related to the page they’re on so you can capitalize on visitors’ interest in a particular subject. As soon as a visitor lands on your website, you can start learning about their conversion path. This path starts when a visitor visits your site, and ends (hopefully) with them filling out a form and becoming a lead. However, sometimes a visitor’s path doesn’t end with the desired goal. In those cases, you can optimize the conversion path. How? Take a page out of Surety Bonds‘ book. They were struggling to convert visitors at the rate they wanted, so they decided to run an A/B split test (two versions of a landing page) with Unbounce to determine which tactics were performing better on each page. In the end, they ended up changing a link to a button, adding a form to their homepage, and asking different questions on their forms. The result? A 27% increase in lead generation. According to a HubSpot survey, companies with 30+ landing pages on their website generated 7X more leads than companies with 1 to 5 landing pages. For inspiration, here are 15 examples of well-designed landing pages you can learn from. 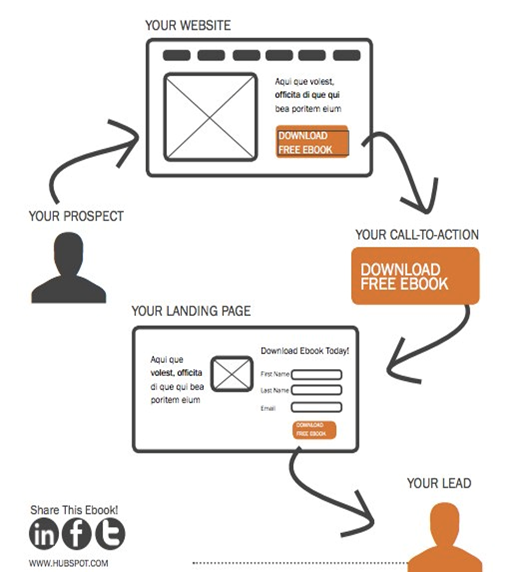 Oftentimes, it’s the landing pages that get all the love in the lead generation process. But the thank-you page, where the visitor is led to once they submit a form on the landing page and convert into a lead, shouldn’t be overlooked. Once a visitor converts into a lead and their information enters your database, you have the opportunity to send them a kickback email, i.e. a “thank-you” email. In a study HubSpot did on engagement rates of thank you emails versus non thank you emails, kickback emails doubled the engagement rates (opens and clickthroughs) of standard marketing emails. Use kickback emails as opportunities to include super-specific CTA and encourage sharing on email and social media. If your homepage’s design is what catches a person’s attention, the CTA is what keeps it. However, don’t bombard your visitors with an invitation to see the longest or most complex content you have. In general, consumers want their browsing experience to be as non-invasive as their buying experience. Oftentimes they’re not ready to make a purchase when they first find your website. To teach them about you with no effort or commitment on their part, invite them to subscribe to an email that notifies them of industry trends and product updates. Personally follow up with the ones who opt to stay on this mailing list to gauge their interest and eventually turn them into marketing qualified leads (MQLs). Free trials and demos are a growing company’s bread and butter. They allow you to generate demand in your business and create a contact list of leads who are currently piloting your product. On your homepage, have your product available to try for free for a limited time using a CTA and form where you can collect their names and email addresses. At the end of each active product demo, follow up with the user to see what they thought of it. Another non-invasive way to generate interest in your business is to create blog content that promotes an ebook or whitepaper, wherein your website visitors can learn more about the same topic they just read about on your blog. This is where lead generation meets search engine optimization (SEO). Blog content is your way of developing the page authority needed to rank your website on Google. Organic visitors who come from Google are often more intent on finding solutions to a problem you can solve — making this form of lead generation quite valuable. To start, conduct keyword research on a topic that’s relevant to your industry, and create a group of blog posts around this topic. Then, draft a report that delves much deeper into this topic. Package this report into a PDF that your blog readers can download using their name, company, and email address. Using the three-part conversion path described in tip #2 above, email each person their downloaded resource, following up with them through a kickback email that retains each lead’s interest in the content you’ve provided them. Live chat services are increasing not just in their sophistication, but in how many people expect them when learning about vendors they might want to buy from. This means you could be missing out on a major lead generator. To generate leads though live chat, audit your website to see which pages your visitors spend most of their time on. With the right development resources, you can install a live chat tool on the pages where customers need the most assistance or information. This allows you to casually collect and log insight on their product needs while answering their questions. Depending on who starts the chat and the questions your visitors have, you can even integrate your customer service team with your live chat feature. This ensures every website visitor has their needs addressed no matter where the conversation goes. Dynamic content lets you cater the experience of visiting your website to each, unique web visitor. People who land on your site will see images, buttons, and product options that are specifically tailored to their interests, the pages they’ve viewed, or items they’ve purchased before. Better yet, personalized calls-to-action convert 42% more visitors than basic calls-to-action. 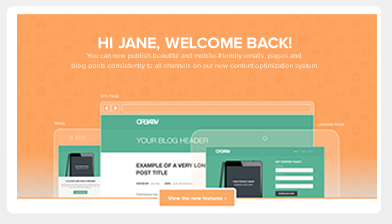 In other words, dynamic content and on-page personalization helps you generate more leads. Notice the “Welcome Back” header? Visitors who see website pages that remember them from an earlier date a more inclined to stick around and start a conversation with you. To get dynamic content (or “smart content”) on your site, you’ll need to use a tool like HubSpot’s Content Management System. We can’t stress this part of the process enough. A/B testing can do wonders for your clickthrough rates. Remember: No lead is going to magically turn into a customer. Leads are only as good as your nurturing efforts. Place leads into a workflow once they fill out a form on your landing page so they don’t forget about you, and deliver them valuable content that matches their interest. 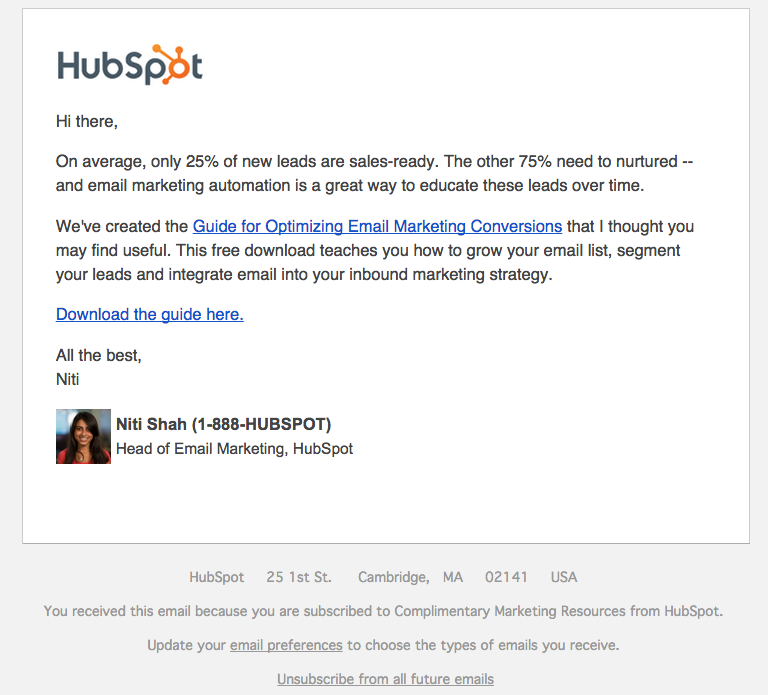 Lead nurturing should start with relevant follow up emails that include great content. As you nurture them, learn as much as you can about them — and then tailor all future sends accordingly. This email offers the recipient some great content, guides them down the funnel, and gets to the point. According to Forrester Research, companies that nurture their leads see 50% more sales ready leads than their non-nurturing counterparts at a 33% lower cost. So get emailing. You depend on leads to close sales and grow your business. Using the tips above, you can take advantage of every opportunity without letting unsatisfied website visitors slip away. InnovatingB2B | Copyright @ 2019 InnovatingB2B. ALL Rights Reserved.